Jorge Lorenzo managed to be the fastest in the qualifying session in Estoril on Saturday (30/4/2011). He managed to beat Marco Simoncelli who had become the favorite won the pole. 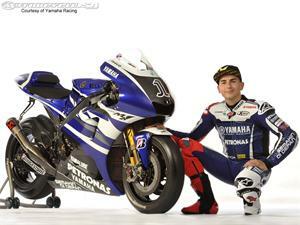 Yamaha rider recorded a best lap time of one minute and 37, 161 sec. While trying to chase but Simoncelli crashed at turn 7. Gresini Honda rider had to settle for second place after starting from 0.133 seconds adrift of Lorenzo. In the third position will be assigned to another Honda rider, Dani Pedrosa. While his teammate Pedrosa at Repsol Honda rider Casey Stoner will start from fourth position. While Lorenzo's Yamaha teammate, Ben Spies was in fifth position. Then where the position of Valentino Rossi? Ducati rider will start from ninth position after 1.110 seconds adrift of Lorenzo. Meanwhile, Rossi's teammate, Nicky Hayden in 13th place.